Back in my Navy days, there was a form of theft that was prosecuted called “misappropriation”. It occurred when someone would take something that belonged to another work center or division and use it for their own division. It was different than larceny because the person didn’t take it for personal use. The money or items never left the ship. But it was still a crime because as a result of the misappropriation, supplies would have to be reordered and money was wasted. The priorities, as set forth in the New Testament, are evangelism, care for orphans and widows, and ministering to the needs of others. But is that where our money is being spent? Or is the priority in the American church the comfort of the members, building bigger ministries, and marketing a user friendly inoffensive message? Have we turned from being fishers of men to being keepers of the aquarium? In light of The Lord’s priorities, how do we justify multimillion dollar building projects? There was no such thing as a church building for the first 300 years of the Church and they changed the world! Lets see what could be done with the money used for a building expansion at a cost of $20 million if it were not spent on the comfort of the flock. The average cost for sending a missionary from America is $6032 a year. (It is even less for support of indigenous missionaries). That $20 million dollars would support 300 missionaries for 10 years and result in the salvation of those who otherwise would have no Gospel witness. Instead we make the church larger and offer more programs to attract spiritual consumers that will be called "Christians" because they sign their names on a card, or slip their hand up for prayer when no one else is looking around. Ideally, we could have a two for one special and support missionaries that not only preach the Gospel but care for orphans and widows and feed the hungry in Jesus name. Speaking of orphanages, $20 million would run 7 orphanages for 100 years! Not only would we be ministering to "the least of these" by giving the poorest of the poor food, clothing and education, we would be raising up a generation of champions for Christ that would penetrate their culture with the Gospel far more effectively than a mass crusade every couple of decades or so. And yet the American church goes on spending its time and treasure on itself. We use 96% of our finances at home and neglect the Great Commission. Why? So we can have a nicer facility to bring our friends to? To have the best fitness center and yoga classes in town? 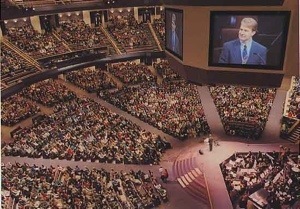 To have bigger and bigger congregations? It is very telling when a senior pastor has to be more of a CEO than a shepherd. I don't mean to be harsh, and I do want to speak the truth in love. But how do we expect God to ignore our extravagance here while missionaries have to spend time begging for the crumbs from the American church's table or risk having to come home? Instead of building bigger churches, how about getting to a certain size and then planting smaller churches where people can grow in a healthy spiritual environment where they can't go and be anonymous. Wy the desire for spiritual empires? In the First Century they didn't bring people to church to get them saved. They could all tell someone about Jesus and salvation. They went out and made disciples, and brought them to the congregation so they could be shepherded and grow. The church growth program of the first church is still the only church growth program God approves of. Lift Jesus up so that He draws all men to Himself, and co-labor with Christ to add to the church daily as many as should be saved. On the flip side, it is also wrong to spend money on orphanages that refuse to teach children the Gospel. Or to support programs that amount to little more than sending a social worker that don't tell anyone how to be saved. It is just as wrong to preach to a hungry person without feeding them as it is to feed someone without telling them about Jesus! This seems hard, and in some ways it is. But please know that I love the American church. Over the past few centuries America has been a launching pad for literally thousands of missionaries and evangelists. But we have to wake up and get our fiscal policy in line with His. After all, it is supposed to be The Lord's money, right?